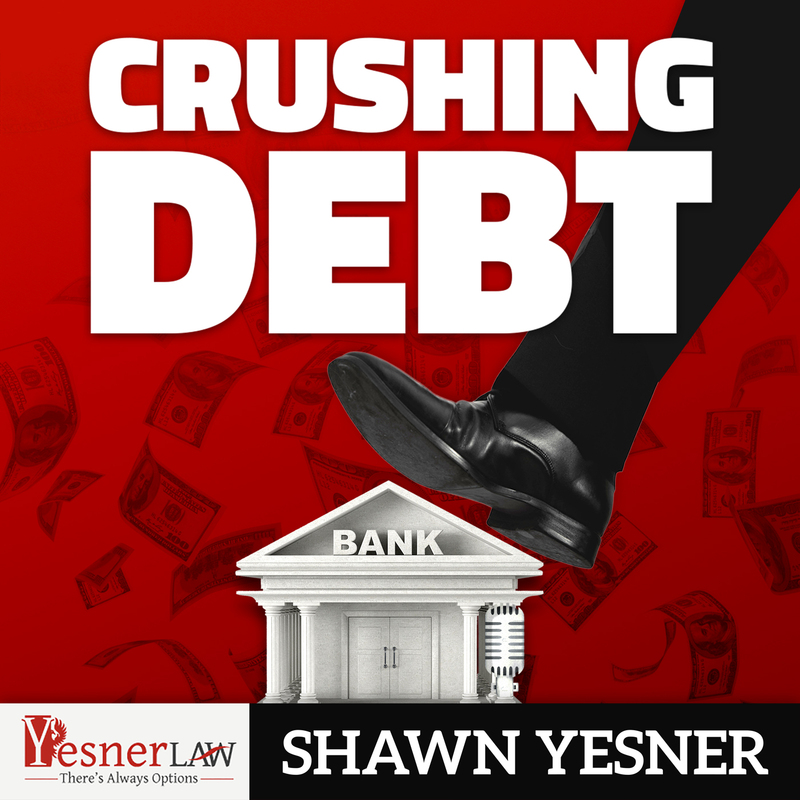 Description The Crushing Debt Podcast is hosted by Shawn M. Yesner, Esq., owner of Yesner Law, P.L., that helps our clients eliminate the financial bullies in their lives by providing options. We help clients with real estate litigation, partition, quiet title, chapter 7 liquidation, chapter 13 reorganization, short sales, loan modifications, and creditor harassment. We have Chris Calandra from Elliott Wealth Management Services back on the show to talk about the benefits of life insurance. Chris and Elliott Wealth are now sponsors of The Crushing Debt Podcast, and you can support them by going to the website - www.ElliottWealth.com to request your free 15-minute life insurance checkup. A service offered only to listeners of the Crushing Debt Podcast. In this week's episode, we talk about the benefits of Term Life Insurance, including to protect your family and your business from a financial loss. Insurance can also be used to give to your favorite charity or cause. Insurance is strange in that it is one product that no one likes to buy or use, but when it is needed you're glad you have it. Elliott Wealth Management Services is a comprehensive financial planning firm and an independent adviser (meaning they are not bound to provide you with any particular company's product and can choose from many different options). You can listen to Chris's last interview on the show at Episode 157. Again, for listeners of The Crushing Debt Podcast, go to www.ElliottWealth.com to request your free 15-minute life insurance check up. If you have questions for me, please email Shawn@YesnerLaw.com or visit www.yesnerlaw.com. In this week's Crushing Debt Podcast episode, we have a returning guest, Paul Moore of Wellings Capital. Paul was a guest on Episode 78 talking about reducing tax liability using multifamily investing, and promoting his book "The Perfect Investment." 1. Two new private equity funds Paul has launched for real estate investors, an income fund and a growth fund. Paul has used a value formula for commercial real estate investing and discovered that he can separate the funds into mostly self-storage facilities, mobile home parks and multifamily investing. 2. How he went from $1.7 million in the bank, to $2.5 million in debt, to debt free in 2008 / 2009 by giving his way out of debt. You can visit Paul's website at www.WellingsCapital.com, or email Paul at Paul@WellingsCapital.com. If you want to contact me, please visit www.YesnerLaw.com, or Shawn@YesnerLaw.com. In this week's episode of The Crushing Debt Podcast, I talk about a Federal law that went away, came back in the form of a Florida law, and now is back as a Federal Law - The Protecting Tenants in Foreclosure Act. The federal version of the law allowed a tenant to remain in his lease if the house was taken in foreclosure, except under certain circumstances. The Florida version of the law required a 30-day notice by the creditor (less tenant friendly than the federal version). The new federal version brings back some of those more tenant-friendly provisions, with a few changes. If you buy foreclosure properties and have questions about the law, please contact me at Shawn@YesnerLaw.com or www.YesnerLaw.com. In this week's episode of the Crushing Debt Podcast, I interview attorney Derek Bernstein. Derek practices personal injury law, represents doctors in PIP (personal injury protection) lawsuits, handles family law matters, and represents small businesses. Derek's YouTube channel has over 70 videos on different legal topics; How Derek & I met (hint: SEO from years ago); In January 2019 Derek started his own lawfirm (and how he did it); Derek's background as an entrepreneur at a young age; How Derek leverages his network How many people told him "time to start your own firm;" and Lessons he's learned in starting his own practice. To connect with Derek, visit www.LawBernstein.com, email him at Derek@LawBernstein.com, connect with him on Facebook, or call him at 727-209-7957. Do you have a story of how you overcame debt, or know someone who has? I would appreciate interviewing them on my show. Have them connect with me at Shawn@YesnerLaw.com or www.YesnerLaw.com. When someone hires me to file a bankruptcy for them, one of their first questions is "how will this impact my credit?" My concern is eliminating their liability. What good is a credit score that is smashed from unpaid bills and creditors chasing you? Credit repair and debt negotiation can be great tools to increase your score or avoid bankruptcy. Please do your due diligence to ensure you're being treated fairly by the credit repair company you choose, or reach out to me for a free consultation at Shawn@YesnerLaw.com or www.YesnerLaw.com. Welcome to the first episode of Year 4 of The Crushing Debt Podcast! This week's episode is an interview with Chris Calandra of Elliott Wealth Management Services, LLC. Chris is also the host of the Simply Financial Podcast, an innovative, comprehensive, informative and cutting edge Podcast that discusses financial topics ranging from personal finance, economics, politics and personal growth. Simply Financial will cover intriguing and thought provoking questions so that the listener can simply increase their financial IQ (check out episode 78 - Season 3, Ep 7). What makes a good client What is on the horizon Creating an emergency fund Using online savings accounts Tax issues Asset protection Elliott Wealth's 5 Gold Medal Services And more great strategies! If you have questions about creating, investing, or saving, please reach out to Chris and his team at ccalandra@elliottwealth.com. If you have questions for me, please contact me at Shawn@YesnerLaw.com or www.YesnerLaw.com. Welcome to the last episode of the third year of the Crushing Debt Podcast! When this episode is released, I will be at Podfest Multimedia Expo 2019, attending for the third year and speaking for the second year in a row! As I reflect on last year's episode of the podcast, I am really happy about the goals that I've accomplished between Podfest 2018 to Podfest 2019. I've got 3 goals for Podfest 2019: (1) increase download numbers, (2) sell more Crushing Debt Books, and (3) be a guest / have more guests on this show. Just because you may, or may not, be at Podfest, you can still help me accomplish those goals. I am very appreciative of my audience and all the support you've given me so far, and am looking forward to Year 4 of the show. You can find me at Shawn@YesnerLaw.com or www.YesnerLaw.com. In this week's episode of the Crushing Debt Podcast, I review the major clauses of a standard Mortgage. I remember closing on my house(s) and reading the mortgage. Some sections I knew were boilerplate and some sections I slowed down to read. Also, in the course of representing homeowners buying their first home, I typically read the mortgage. This week's podcast episode comes from a question from one of our listeners, Dave. Thanks Dave for a great question! In this week's episode of The Crushing Debt Podcast, we talk to our friend and fellow attorney Scott Smith with Royal Legal Solutions, and host of the Real Estate Nerds podcast. Scott and I discuss asset protection issues for real estate investors, but could be used by any business owner, entrepreneur, or solopreneur. - Business owner protecting themselves from frivolous lawsuits. - How a business owner can quickly implement asset protection. - Top techniques for asset protection. - Pros and cons of insurance protection. Text "Royal" to 474747 to get Scott's Top 10 things you need to know about asset protection. Visit his website, www.RoyalLegalSolutions.com. Also subscribe to his show, Real Estate Nerds, available on all major podcast players. If you're located in Florida and have specific asset protection questions, please reach out to me at Shawn@YesnerLaw.com or www.YesnerLaw.com. Please listen to the episode if you want to learn how to obtain a free copy of the Crushing Debt Book! If you have questions about real estate investing in Florida, please contact me at Shawn@YesnerLaw.com or www.YesnerLaw.com. In this week's episode of The Crushing Debt Podcast, we interview our friend Scott Carson of We Close Notes. We first met Scott at Podfest 2018 and look forward to spending time with him again at Podfest 2019. We were also happy to be a guest on Scott's Show - The Note Closers show. Scott buys and teaches others to buy non-performing debt at a discount, and then negotiates to help people stay in their homes (or leave with dignity and little to no liability). Scott and I discuss what types of loans Scott buys (from big banks, from private investors, etc. ), why bad debt may be good debt, old loan modifications that may turn into bad debt, and different types of loans. To contact Scott, visit www.WeCloseNotes.com or email Scott at Scott@WeCloseNotes.com. In this week's episode, we interview Ryan Abremski, Director of Business Development for Executive Care, a home care company. Health care costs are one of the main reasons that someone files for bankruptcy. As we age, health care becomes an increasing concern. But what if we're still "young" and need a bit of help around the house while recovering from surgery, or if we have some medical issue that prevents us from taking care of ourselves in the home. Ryan's company helps to take of us in our home. He assists people with short term or long term care, for everything from assistance to people with disabilities, to surgery recovery. To contact Ryan, visit his website at www.executivehomecare.com, email him at Ryana@ExecutiveHomeCare.com or call him at 727-726-7600. If you have questions for me, I can be reached at Shawn@YesnerLaw.com or www.YesnerLaw.com. In looking back on last year, I accomplished many of the goals that I set for myself. In this week's episode of The Crushing Debt Podcast, I lay out my system for setting and accomplishing those goals. In this week's episode of The Crushing Debt Podcast, I talk about a few tips to help you budget. As I've always said, there are two ways to get more money - increase income and decrease expenses. In this week's episode, I talk about ways to use your budget to do both. What are some of your favorite budget-busting tips? What are some things you have done to increase income or decrease expenses? Please let me know at Shawn@YesnerLaw.com or www.YesnerLaw.com. In this week's episode of The Crushing Debt Podcast, I have a return guest. Rob Kellog is my guest this week. Rob is the host of the Brewin Up Business podcast. Rob and I, over a few adult beverages, discuss intellectual property law and at what point should you apply for a trademark and what that process entails. To attend one of Rob's live Brewin Up Business events, you can visit his website at www.brewinupbusiness.com, and subscribe to the Brewin Up Business podcast. If you have intellectual property questions, please contact me at shawn@yesnerlaw.com or www.yesnerlaw.com. 16. Episode 147 - What's the Difference between Chapters 7 - 13 - 11? One of the questions I'm asked most often, "What is the difference between a Chapter 7, Chapter 13 and Chapter 11?" This week's episode answers that question. Chapter 7 is called liquidation. The Trustee will take any non-exempt assets, turn them into cash and pay off creditors. If all of your assets are exempt (protected) the creditors get $0.00. Chapter 13 is called reorganization. The Trustee will pay your creditors based on any disposable income you have (or based on the value of any non-exempt assets, whichever is greater). Chapter 11 is also a reorganization, but it is for businesses that want to reorganize, OR it is for individuals that don't qualify for Chapter 7 (because they have income or they have non-exempt assets), OR it is for individuals that don't qualify for Chapter 13 because they have too much debt (there is a limit to the amount of secured and unsecured debt you can have in a Chapter 13). The main point of today's episode is to consult with a bankruptcy attorney in your area if bankruptcy might be an option. If you want me to help connect you to a bankruptcy attorney in your area, please contact me at www.yesnerlaw.com or shawn@yesnerlaw.com. This week's episode of The Crushing Debt Podcast is our fourth (or third and a half) interview with our friend Tiffanie Kellog. Tiffanie and I discuss a question I've tackled over the last few episodes - what are some tactics to motivate referral sources who are all the same profession? How do you give back to a group of similar professions that all refer you business. - Featuring your referral source on a podcast, YouTube Video, co-author an article, or newsletter. - Set up a speaking engagement for your referral source. - Giving or collecting Testimonials (especially those that speak to a common objection a client may have to hire you). - Calling your network to simply ask "How are you doing?" To learn all 16, please contact Tiffanie at Tiffanie@asentiv.com or https://tiffaniekellog.com/ or https://tampa.asentiv.com. I've always said that there are two way to create money to pay down or pay off your creditors: (1) make more money, or (2) cut expenses. One of the ways I've been able to make more money is through word of mouth networking, and many episodes of the Crushing Debt Podcast discuss networking topics. Some episodes that talk about networking in general are 133 (FinCon2018), 33 (Business Card Graveyard) and 17 (Running and Goal Setting). Every 6 months, my community has a garage sale, which is a great place to practice your sales skills - episodes 118, 86 & 68. I've got episodes on living a spectacular life with the Asentiv program - 76, as well as word of mouth networking with Tiffanie Kellog (episodes 48 & 12). Jason Avery with Constructing Success is episode 8. Why I do what I do is episode 5. I also talk about the difference between generating a referral versus an introduction to a referral source. I talk about tips and strategies to network at events and one-to-one. Finally, I talk about a question we'll tackle on a future episode - "feeding" multiple of the same type of referral sources. I hope you enjoy this episode of the podcast. What are some of your favorite networking tips? Please share at Shawn@YesnerLaw.com or www.YesnerLaw.com. 19. Episode 144 - Why do our clients file bankruptcy? These types of debts do not discriminate between Chapter 7 & 13, and neither chapter necessarily better or worse to deal with these debts (look for a future episode on the difference between Chapter 7 Liquidation and Chapter 13 Reorganization, or check out our blog). Please contact me at Shawn@Yesnerlaw.com or www.yesnerlaw.com with what other reasons you think people might file for bankruptcy, or questions you have around these different debts. In this week's episode of The Crushing Debt Podcast, I talk about a topic requested by our listeners - divorce, real estate and debt. While I've talked about each of these subjects in some manner, this is the first episode dedicated to the intersection of all three. What should you know about real estate that you jointly own with your ex? What should you know about debt that you jointly owe with your ex? How did you take title when you were married and how does that impact the debt, and then the divorce? We explore all of these topics. I would appreciate if you would share this episode with someone you know who is getting a divorce, or thinking about a divorce. We do not practice family law, but can help the divorcing couple to figure out what they can do with their home and debt. You can reach me at Shawn@YesnerLaw.com or www.YesnerLaw.com. In this week's episode of the Crushing Debt Podcast, I interview Conor Richardson, author of The Millennial Money Makeover book which will be released on Jan. 1, 2019, so order your copy now at www.MillennialMoneyMakeover.com. Conor is a CPA and Author who earned his Accounting and Finance Degree at the University of Georgia. Once he obtained his Masters of Accounting degree from Villanova and became a CPA, Conor moved to New York to work with Deloitte & Touche, and now lives in Austin, Texas, as an entrepreneur. As the title suggests, the book is written from the perspective of a Millennial's approach to money. Conor's story is a turnaround story on debt, and alignment of goals. Although geared towards Millennials, the book could be read and utilized by all the different generations. To reach Conor directly, Conor@MillennialMoneyMakeover.com. Please email me at Shawn@YesnerLaw.com or www.YesnerLaw.com if you have any questions or want to suggest future show topics. Happy Thanksgiving from The Crushing Debt Podcast and Yesner Law! I recorded this episode while waiting for my open house to start. The open house was a celebration of my 20 years practicing law, so it provided a great opportunity to review 2018. I also provide some insight into how I set and track goals. I also look forward to 2019. Thank you all for being listeners to the show! If you have questions, contact me at Shawn@YesnerLaw.com or www.YesnerLaw.com. Have a great Thanksgiving Holiday and a prosperous 2019! In this week's episode of The Crushing Debt Podcast, I talk to the Cash Wise Ex Wives, Kayla Sloan and Shanah Bell. I met Kayla and Shanah at FinCon 2018 in Orlando a few months ago. Kayla and Shanah are both divorced themselves and met at FinCon 2017. They talked about their journey of divorce and debt and, although each had their own business, they had people continue to come to them asking for help with their divorce and money issues. So they started www.CashWiseExWives.com, a membership site with resources to help both men and women handle issues of divorce and money. You can reach Kayla and Shanah at their website, or follow them on Facebook - Facebook.com/cashwiseexwives, Twitter - @cashwiseexwives, or by email - cashwiseexwives@gmail.com. While they are not attorneys, they do have considerable resources (including introductions to attorneys) who can help you with questions surrounding debt and divorce. If you enjoy the content, please leave us a rating or review on your podcast player. You can also connect with us at www.yesnerlaw.com or shawn@Yesnerlaw.com. I have another returning guest with this week's Crushing Debt Episode. Barb Hennessy was a guest WAY back in episode 37. Today Barb is back to talk about her role as Director of the BSW Academy USA, Inc. and how she helps as an interventionist for PTSD. You can contact me at Shawn@YesnerLaw.com or www.yesnerlaw.com. On this week's episode of The Crushing Debt Podcast, we're happy to have a returning guest, Brian Morris, the Profit Prophet. We last spoke with Brian in Episode 57 and, since then, Brian has had a shift in his business model. Today, Brian works with companies to help them find the best service providers in 5 areas of concentration: Direct Costs, Qualification for Grants, Work Flow Processes, Risk Mitigation and Growth Potential. Brian will analyze, advise and connect. Best of all, Brian doesn't charge the customer! Either the customer likes working with the service provider Brian refers, or Brian will find a new service provider. Either the customer saves money, time or efficiency working with the service provider Brian refers, or Brian will find a new service provider. or connect with Brian at brian@dbrianmorris.com. Or for more questions, contact me at Shawn@YesnerLaw.com or www.YesnerLaw.com. In this week's episode of the Crushing Debt Podcast, we talk with fellow attorney, fellow author, and fellow FinCon2018 attendee Leslie Tayne. Leslie is a New York attorney. In addition to her practice (similar to ours) that covers many aspects of debt elimination, Leslie wrote a book called Life & Debt which you can pick up on Amazon. You can also visit her website at www.taynelaw.com or email her at LTayne@TayneLaw.com. If you live in New York and are being harassed by creditors, definitely contact Leslie's office. In addition, while Leslie's main office is in New York, look for her to expand soon into Southeast Florida, which she also discussed in this week's episode. If you have any additional questions, please contact me at Shawn@Yesnerlaw.com or www.YesnerLaw.com. On October 29 & 30, 2018, I have the honor of speaking at the Buy It, Rent It, Profit! Multi Family Summit at the Holiday Inn Westshore. In this week's episode of the Crushing Debt Podcast, I speak to the host of the event, best-selling author, real estate investor, and thought leader in property management and multifamily housing, Bryan Chavis. While this month's event is at the end of October, 2018, Bryan's intent is to promote this seminar throughout Florida, and later across areas of the United States, so please look for us even if you miss this month's event. Bryan has written two books: Buy It, Rent It, Profit! and the Landlord Entrepreneur, both available through Simon & Schuster. For more information, or to connect with me or Bryan, please visit www.yesnerlaw.com or Shawn@Yesnerlaw.com. Hope to see you at the end of October! In this week's episode of The Crushing Debt Podcast, we interview Monica Shah, MBA, Money and Marketing Coach. 3. Do Revenue Generating Activities: (a) speaking, (b) sponsorships, and (c) webinars. 4. What is your Planning / Sales Cycle? For more information, and to see how Monica can help you create a revenue breakthrough, visit her website at www.revenuebreakthrough.com/marketingcalendar. For more information visit our website at www.yesnerlaw.com or contact me at Shawn@YesnerLaw.com. This week's episode was recorded when I presented to a group of Realtors at Become a Better Agent 28 ("BABA") which is an educational seminar hosted by Insured Title Agency and Synergy Title here in Tampa Bay. BABA’s purpose is to identify the needs of an ever-changing market and meet those needs more effectively through disruption, innovation and creativity. If you're in the Tampa Bay Area, definitely check out the next BABA. The first part of the episode is my description to the crowd of the Freddie Mac Exclusionary List - what it is, how someone gets on it, and how we can help real estate professionals off of the List. The second part of the episode is Kevin Overstreet and me talking about "Who is Your Seller" in a situation where the parties are being divorced, or one spouse is deceased, or a trust, or where one spouse signed the note but both are on title or on the deed. Please check out the Crushing Debt Book on Amazon - its now out! And let us know if you have any questions or comments at Shawn@YesnerLaw.com or www.YesnerLaw.com. When this episode is first released, I will be attending FinCon 2018 in Orlando, so I thought I would do an episode about how I network at a large event. I talk about tips, tricks and strategies to maximize your attendance at an event. What are your goals? What do you want to accomplish? How will you know that the conference was a success? Who do want to meet with? What attendees? What speakers? In addition, I have an exciting announcement - the Crushing Debt Book is out on Amazon! If you have questions about how to network at an event to maximize your return on your educational investment, please contact me at Shawn@YesnerLaw.com or www.yesnerlaw.com. I've often talked and blogged about the Freddie Mac Exclusionary List. This week's episode of The Crushing Debt Podcast focuses, again, on tips, techniques and strategies to come off of the List. A real estate professional (Realtor, Mortgage, Buyer, Seller, Investor, Title Company, Attorney, Inspector, Appraiser, etc.) who finds themselves on the Exclusionary List cannot participate in a real estate transaction where Freddie Mac (Federal Home Loan Mortgage Corp or FHLMC) is a party. We have been successful in getting people off of the Exclusionary List. To be fair, we have also been unsuccessful in getting people off of the List, but we have many more approvals than denials. You would be a HUGE help to Yesner Law if you would please share this episode with any Mortgage Officer that you know - they have access to the List and can refer us people who find themselves on the List. Have them contact us at Shawn@YesnerLaw.com or www.YesnerLaw.com. This week's guest on the Crushing Debt Podcast is Claudia Mitchell-McLeod with Next Level Financial Partners. We met Claudia through our friend Robin Lavitch of Surpass Your Goals (you can hear Robin on Episodes 92 and 98 - or follow us on Facebook where we will post links to those episodes). Claudia has been in Financial Services since 2000, starting as a benefits administrator and then moving into human resources. Her passion is working with women. Claudia's next Vision Board seminar is September 15, 2018, at her office in the Kennedy Room, you can sign up and get more information by visiting her website at www.NextLevelPartners.com, or CMitchellMcLeod@financialguide.com. You can contact us at www.YesnerLaw.com or Shawn@YesnerLaw.com. 34. Episode 129 - Foreclosure Mediations are a Waste of Time! Unsure what to say about this week's episode. I fired up the mic after a particularly troublesome "mediation" I had with Ocwen. I put "mediation" in quotes because the bank was clearly not mediating in good faith - and they rarely do. In a typical mediation, one party starts with one perception of the case, and the other party starts with a competing perception of the case. The role of the mediator is to assist both parties in some middle-ground compromise unless, of course, we're talking about a loan modification mediation - in which case the bank pays lip service and asks the homeowner to provide multiple copies of the same documents. The bank representative then ignores those copies, asks the homeowner to send in yet another copy of the same documents, ignores those documents and then tells everyone at mediation that the bank is missing documents! In all of my years assisting homeowners in foreclosure, I've walked away from the mediation with a signed loan modification ONCE and that was with a credit union. The purpose of that stat is not to discredit myself or my abilities, but more to point out that the banks never mediate in good faith to try for a resolution. In fact, at one mediation, I had a bank's attorney admit, "the only reason for mediation is to see if the homeowner provided all of the necessary documents." Luckily, many less people are in danger of foreclosure now than when mortgage foreclosure mediations were created as a specific type of mediation. Hopefully, this is process that will end its uselessness soon, so we can proceed to have good faith discussions on how to resolve mortgage foreclosures. If you're trying to modify your home mortgage, you could get more relief by hitting yourself over the head with a hammer. Before you do that please contact me at Shawn@YesnerLaw.com or www.YesnerLaw.com. The Bankruptcy Abuse Prevention and Consumer Protection Act of 2005 (BAPCPA) made major revisions to the Bankruptcy Code. In this week's episode of The Crushing Debt Podcast, we talk about one of the more sweeping changes - the Means Test. The means test is complicated and there is an art and a science to completing the information. The means test is important because it helps determine whether someone can file Chapter 7 (Liquidation) or Chapter 13 (reorganization). If you have questions about bankruptcy, or the means test, or whether you qualify for Chapter 7 or 13, please contact me at Shawn@YesnerLaw.com or www.YesnerLaw.com. In this week's episode of the Crushing Debt Podcast, we interview Gordon Newton, President and Co-Founder of the Newton Group. Do you have a timeshare that you don't want anymore? Were you "oversold" on your timeshare? Are you interested in buying a timeshare? Although he's not an attorney, I first heard Gordon on The Cash Flow Guys podcast, and talked about a particular nasty timeshare exit client that I have - he was very helpful with strategy. Today is also my mom's birthday!! She turns 21 every year, it's amazing. Those of you who can, reach out and say "I love you" to your moms today, I know I will be! In this week's episode, I go over Schedules I & J of the Bankruptcy Petition. Schedule I describes the debtor's income - all sources of the debtor's income: wages, income from operating a business, interest and dividends, family support (like alimony and child support), unemployment, social security, pension, government assistance, and "other." Basically any and every source of income must be disclosed on Schedule I.
Conversely, Schedule J describes all of the debtor's expenses - rent, utilities, food, medical bills, insurance, taxes, car payments, alimony and child support, and other payments that you make. The trick to Schedule J is that the expenses must be accurate, but also reasonable. Schedule I & J help the trustee determine that the debtor should be in a Chapter 7 (Liquidation) or Chapter 13 (reorganization), and that the debtor's payment to creditors, if in a Chapter 13, is reasonable. If you have questions about completing Schedules I & J, or completing the bankruptcy petition itself, please contact our office for a free consultation. www.YesnerLaw.com, Shawn@YesnerLaw.com. - Where can a personal injury lawsuit be filed? What if one party lives out of state? What court, Federal or State, has jurisdiction? Dale can be reached at DAppell@wefightforjustice.com, or visit his website at www.wefightforjustice.com. Or you can contact me at Shawn@YesnerLaw.com or www.YesnerLaw.com. I met Stephanie Heredia from an email she sent me describing the Entrepreneur Center Program on Campus at the University of Tampa (something she is involved with for her business). Immediately, Stephanie struck me as an entrepreneur on the rise. Her company is www.taxestampa.com where she helps individuals and business owners with bookkeeping and tax preparation services. You can reach Stephanie at Stephanie@taxestampa.com. From its website: The John P. Lowth Entrepreneurship Center in the Sykes College of Business teaches skills that are critical for today’s entrepreneur. Learning to identify opportunities, prepare executable business plans and hone skills through a combination of classroom study and applied learning, makes our program unique. Entrepreneurship education is the fastest growing field of study in the United States, with entrepreneurs projected to be the group that creates vigorous and sustained economic development worldwide. Stephanie and I talk about entrepreneurship, and also mistakes students make in filing their tax returns, including: whether or not to file, whether to pay sales tax in their business, and money management. This week's guest on the Crushing Debt Podcast is going to take two episodes to fully cover all of the great content. However, if you want some behind-the-scenes topics we didn't cover on either show, please visit my YouTube Channel to see some bonus content. My guest is my friend, Dale Appell of the Dale Appell Law Group, and www.wefightforjustice.com. You can contact Dale by email at Dale@wefightforjustice.com. Dale is a 1989 graduate of Duke Law School, and a member of the Multi-Million Dollar Barrister Association - meaning he has won verdicts totaling over $1 million (on a single case). Dale and I talk about Asset Protection, and how to shield yourself from an attorney like him trying to take your assets after obtaining a personal injury judgment against you. We also talk about what you should do after an accident. If you're in an accident, call Dale for assistance and let him know that you heard about him from the Crushing Debt Podcast, or contact me for an introduction to Dale - www.Yesnerlaw.com or Shawn@Yesnerlaw.com. In this week's episode, I talk about an exciting new project from Crushing Debt (you'll have to listen, although I've dropped a few social media hints). However, I do make an offer for you (my listeners) to be involved in this new project by shooting me an email to Shawn@YesnerLaw.com. To continue to provide additional content, I give you my take on 1031 Exchanges and how those can impact real estate closings. I am not a qualified intermediary, nor are we tax attorneys or CPA's, but I have done enough 1031 exchanges in my day to understand the law behind the exchange of like-kind properties to defer the taxable gain on the sale. For more information, check out my website at www.yesnerlaw.com. Last week's episode was about reverse mortgages. This week's episode of the podcast features Jeannine Smith, loan officer with Fairway Independent Mortgage, and we discuss mortgages in general. Jeannine's email address is Jeannine.Smith@fairwaymc.com and her website is www.jsmithmortgage.com. Jeannine has been in the mortgage industry for about 12 years, since 2006. Buying a house is easier than you might think. Jeannine and I dispel myths, like how much you may need in a downpayment, and how your credit score impacts your ability to get a mortgage. We also talk about best practices and what you can do to better qualify for a loan. Fairway Mortgage is a lender offering a range of products. Jeannine is focused on helping Veterans obtain VA loans, and educating those who might qualify on the pros and cons of that, and other, loan products. You can get ahold of Jeannine at the links above, or contact us at Shawn@YesnerLaw.com or www.YesnerLaw.com. What are some other myths you have about mortgages that we can help dispel? On this week's episode of The Crushing Debt Podcast, we talk with Reverse Mortgage expert Michael Banner, www.professionalmortgagealliance.com. You can also email Michael at mbanner@pmanow.com. Michael and I discuss the myths and truths of a Reverse Mortgage. Michael is a frequent speaker on the use of home equity during retirement. I have a very special guest on this week's episode. Jimmy Murray is a friend and fellow Podcaster, also part of the Florida Podcaster's association. If you have young kids, check out his podcast, The Kid Friendly Joke of the Day! Jimmy has done Stand-Up Comedy, Improv, Blogging and Podcasting, but for our show, his biggest accomplishment has been paying off over $80,000 of debt comprised of Medical Bills, Credit Cards, Student Loans, and a few Judgments. We talk to Jimmy about his journey to become debt free. You'll learn some of his secrets on reducing or cutting monthly expenses, using your money to reduce your debt, and remaining accountable to yourself, your family and your goals. If you have questions, or want help to get out of debt, email me at Shawn@YesnerLaw.com, or visit the Firm's website. Twice a year my homeowner association hosts a community garage sale. Previously (episodes 68 and 86) I discussed lessons that I've learned selling my sh ... tuff at the community garage sale. This week's episode describes another lesson learned, this time at the Spring 2018 garage sale. If you have questions, please visit my website, or email me at Shawn@YesnerLaw.com. In this week's episode, I interview Patty Durell and Marleta Black. Patty owns Rock Solid Fitness since 2012 and has been a physical therapist since 1994. Each year, Rock Solid has achieved over 40% growth and now has 10 staff. Patty is on the show to discuss how your physical health impacts your ability to handle debt and stress. The growth of Patty's company can be attributed to her work with Marleta Black, who has 31 years of small business and leadership consulting, running teams of 5 to 120 employees using her degree and training as a psychologist. As Patty is Marleta's client, Marleta is also Patty's client and they have a great personal and professional relationship. Patty, Marleta and I talk about making and keeping goals and how those skills can help you eliminate debt. Any questions, I can be reached at Shawn@YesnerLaw.com or at the Firm's website. Our last episode of May is an interview with Rich Carey of www.RichonMoney.com. Rich is our third military interview in as many weeks, and is currently in the US Air Force, 2 years from retirement. On his website, www.RichonMoney.com, under the Real Estate Tab, you'll find his "Complete Guide to Real Estate Investing." Rich flipped houses in Washington D.C. to help build his income, he purchased rental properties for cash, he paid off $32,000 in student loans, and his $280,000 mortgage in six years !! For more information, visit his website, or contact him at Rich.Carey@gmail.com, or contact me at Shawn@YesnerLaw.com or www.YesnerLaw.com. This week, we interview Financial Advisor Forrest Baumhover with Westchase Financial Planning. Our office is located in Westchase, just outside of Tampa, Florida. We met Forrest with a Keep It Local networking group. We both enjoy running, and helping people manage their money. In fact, both Forrest and I will be at FinCon, September 26 - 29, 2018, in Orlando, FL. Forrest retired from the Navy in April 2017, and now helps his clients understand and plan for retirement. You can contact Forrest at Forrest@WestchaseFinancialPlanning.com or www.WestchaseFinancialPlanning.com. Or you can reach me at Shawn@YesnerLaw.com or www.YesnerLaw.com. In this week's episode, we interview Doug Nordman ("Nords") about his book The Military Guide, which you can find on his website, the-military-guide.com. Nords joined the Submarine Force (Navy) right out of college and, upon retirement, found that there was a lack of information to show military members how to retire without having to go back to work. The Military Guide provides service-members, veterans and their families with a road map for becoming financially independent. For more information, visit his website, or contact me at Shawn@YesnerLaw.com or www.YesnerLaw.com. In the week's episode of the podcast, I talk to Chris Costello, Chairman and Co-Founder of Blooom.com (with three "o's"). You'll hear the story of how Blooom.com got started in 2004, how the company created its vision and mission (and sticks to those ideals consistently). Chris and I talk about why he started a DIY Financial Planning Company and the challenges most of us face when dealing with "traditional" financial advisors. Chris even throws in a few tips on how he manages his debt, and his finances. For more information, visit their website at www.blooom.com, remember there are three "O." And for more information about the all of our episodes, please visit our website at www.YesnerLaw.com or email me directly at Shawn@Yesnerlaw.com. In this week's episode of the podcast, we interview our friend, Jim Jenkins, founder of Jenkins Law. Jim started Jenkins Law in 2013 following stints as a Pinellas County Assistant State Attorney (prosecuting people who violated criminal laws), and as an associate attorney at a large Clearwater firm handling personal injury matters. In fact, just about 3 years ago, Jim's wife, Kelly-Ann Jenkins joined the firm as a partner, and helped Jim grow a firm that now has multiple staff and 2 other associate attorneys. Jim, Kelly-Ann and the team handle criminal law, personal injury law, and insurance litigation (first-party and third-party litigation). In today's episode, Jim and I discuss first party insurance litigation - where you sue your own insurance company for damages covered by your insurance (versus third party litigation, where you sue the insurance company of the person who injured you). For more information about first party litigation, or if you have questions about your rights under your own insurance policy, contact Jim through his paralegal Kate at Kate@JenkinsLawPL.com, or visit the website at www.JenkinsLawPL.com. Or, if you want us to make the introduction to Jim and his team, contact us at Shawn@YesnerLaw.com or www.YesnerLaw.com. This week's episode is an issue we get quite often unfortunately. What happens when the Seller knows about a defect with the house and fails to disclose it? What happens when the Seller does not know? What happens when the inspector misses an issue with the house? What happens when the Realtor knows (or doesn't know) about an issue with the house? What is the main case in Florida that discusses this issue? What do you think? Let me know at Shawn@YesnerLaw.com or www.YesnerLaw.com. Another week, another guest from Podfest Multimedia Expo 2018. This week's guest is Ryan Kairalla, an entertainment law attorney. Also check out the Break The Business Podcast, and Ryan's book, Break the Business available on Amazon, Audible, Apple Podcasts and other book outlets that don't begin with the letter "A." The deadline to file your personal income tax return is in a few days. Therefore, in Episode 109, we talk with Craig Cody, who we met at Podfest 2018, about the 10 Most Expensive Tax Mistakes that Cost Business Owners Thousands. On this week's episode, I talk about a recent case: The mortgage lender modified my client's loan and put the arrears at the end of the loan. Years later, the mortgage lender wrote off the debt and issued my client a 1099-C, Forgiveness of Debt, showing the home owner had phantom income. Sometime later, the client came to me to file a Chapter 13 bankruptcy. When the lender filed its claim in the bankruptcy case, the lender included the amount of debt previously forgiven! The status of the law is unclear and states differ on the effect of issuing the 1099-C form (Florida hasn't made a decision as far as I know). How did we resolve the issue? If I gave it way in these notes, why would you listen to the episode? If you file bankruptcy and your creditors try to pursue debt previously forgiven by a 1099-C, please contact me at Shawn@YesnerLaw.com or www.YesnerLaw.com. This week's episode of the podcast is an interview with Dave Fulk and Frank Coto with Hello Alex. Hello Alex is an Artificial Intelligence system to help Realtors communicate with their clients and prospects. Hello Alex helps Realtors convert leads over multiple platforms using Artificial Intelligence (text, FB messenger, Live Chat, etc.). For more information, check out HelloAlex.io. Or you can reach out to me at Shawn@YesnerLaw.com or www.YesnerLaw.com. Christie is back for her fourth episode of The Crushing Debt Podcast. Bear with me this week, as I deal with some laryngitis. Christie and I have discussed student loans, but in this episode, we're going to talk about consumer law - the TCPA (Telephone Consumer Protection Act). The TCPA is designed to stop robocalling, and abuse or harassment of borrowers by creditors. Creditors can pay damages of between $500 and $1,500 PER CALL if they are told to stop making calls and cease to do so. To contact Christie, visit her website www.ChristieArkovich.com or 813-258-2808. You can also reach us at Shawn@YesnerLaw.com or www.YesnerLaw.com. We have a great guest to kick off Year 3 of content here at The Crushing Debt Podcast. We met Mary Wheeler, of Abundant Wealth Solutions, at PodFest Multimedia Expo 2018 this past February in Orlando, FL. Mary is a financial coach who holds local workshops, speaking to high school and college students about the dangers of debt. Mary's mantra is "Know debt, no problem!" and that makes her a perfect guest for The Crushing Debt Podcast! What we found incredible was that Mary eliminated over $30,000 of debt in 96 days! Hear her story and her tips in this week's episode. In this week's episode of podcast (the last of Year 2), we talk about Property Tax Portability. Applications to qualify your FL residence as your Homestead were due March 1, however what happens if you move from one primary residence to another? Florida has a "Save Our Homes Cap" that prevents the taxable value of the homestead property from increasing by more than 3% from year to year. Previously, when the homeowner moved, they lost that 3% cap. In response, the Legislature enacted "portability" that allows the homeowner to carry with them (to port) their 3% savings from one homestead to another. 60. Episode 103 - Bankruptcy Cases "Dead on Arrival"
In this week's episode, we talk about bankruptcy cases that are DOA or Dead on Arrival - meaning a bankruptcy case that is dismissed within 6 months of being filed. This week's episode is based on an article in the ABI Journal article written by Ed Flynn, a consultant with the ABI (American Bankruptcy Institute. You'll remember Mr. Flynn, who also wrote an article that was the basis for Ep 79, Chapter 13 Success Rates. We discuss all of these statistics, as well as give our spin on Mr. Flynn's findings. If you want to see the article written by Mr. Flynn, please email me at Shawn@YesnerLaw.com. This week, we have a returning guest - Michael Holmes with Delta Credit Restoration. Michael was a guest on Episode 94. In this week's episode, we talk about Debt Negotiation, and the creditor's violation of debt collection laws. If you're being contacted by a debt collector, there are some things you can do to protect yourself. Or, you can contact me at Shawn@YesnerLaw.com or www.YesnerLaw.com. This week's episode is an interview with Attorney Carmen Dellutri, a Board Certified Bankruptcy Attorney. Carmen can be reached via his website. Email Casey Byrus: CByrus@DellutriLawGroup.com and let her know you listened to this show, Carmen will mail you a book for free !! Carmen and I talk about creditor harassment and how you can use the bankruptcy laws and consumer protection laws to help eliminate their debts. 63. 100 - EPISODE 100! I struggled with whether to make Episode 100 something different, or business as usual with another Crushing Debt Topic. I take a look back at the topics we've covered and the guests we've interviewed, to get a sense of where we've been, and where we are, so we can produce great content for you for the next 100 episodes. If this is the first episode you've listened to, Thank You ! If you've been a listener for the last 99 episodes, Thank You! This is my podcast, but it is for you, so what topics do you want me to cover? What guests do you want me to interview? How can I help you eliminate those financial bullies in your life? In this episode of the podcast we talk, again, to Christie Arkovich about student loan debt relief. Did your parents co-sign for your student loan? Did your parents borrow money to pay for your education? Federal Parent Plus loans are exactly that, money that mom and/or dad borrow so their child can go to school. In most cases, the child has an agreement to pay back mom and dad, but this agreement has no impact on the Federal Student Loan and its repayment. So what happens if the child cannot pay back the loan, in other words pay back the parents? Unfortunately mom and dad are still on the hook to the loan company. Christie has some good suggestions to help ease the pressure on mom and dad. Christie and I also talk about a new Fannie Mae program where the homeowner can borrow money secured by a second mortgage against their home, to pay off their student loans - basically converting student loan debt into mortgage debt. You'll hear why I think this is a HORRIBLE idea, and you'll hear Christie's take on Fannie Mae's offer to help student loan borrowers with this new loan product. If you have questions, or if you're struggling to pay back your student loans, you can contact Christie at 813-258-2808, www.ChristieArkovich.com, www.TampaBankruptcyLawyer.com. This week's guest is a returning guest from Episode 92 ("What's Your Relationship with Money?"). In this episode we discuss how to B.O.U.N.C.E. back from setbacks. In this episode we talk about how to change or overcome your beliefs. What are some of your beliefs in terms of money and overcoming set backs? You can contact Robin at www.SurpassYourGoal.com. Or you can contact me at Shawn@YesnerLaw.com or www.yesnerlaw.com. For those of you who want to visit the Yesner Law YouTube page, you can see a great out-take from our recording of this episode! In this week's episode, we interview Michael Watkins with Tampa Bay Advisory, LLC. Michael's company helps with tax incentive recovery - basically the ability to reduce a company's bottom line so that the company pays less taxes and makes more money. Most people know this as cost segregation, which is the ability to depreciate certain asset classes on an accelerated basis different than other asset classes. You can contact Michael at MWatkins@tampabayadvisory.com, call him at 727-243-6467. If you have more questions for me, please contact me at Shawn@YesnerLaw.com or www.YesnerLaw.com. In this week's episode of the Crushing Debt Podcast, I get away from interviews for a bit and talk about Usury Laws. Usury Laws protect consumers from lenders who charge an excessive rate of interest. I had a usury issue come up in one of my cases and I thought it would be interesting to explore the issue in the podcast. The issue is whether unpaid late charges on a mortgage can be "captured" as interest to drive up the interest rate on a residential note and mortgage to a level over 18% (which is usurious in Florida). What do you think? Please let me know at Shawn@YesnerLaw.com or www.YesnerLaw.com. Welcome to the first Crushing Debt Podcast of 2018! In Episode 95, I interview Gordon Firemark, an attorney for the past 25 years, who helps artists, writers and producers achieve their dreams. Gordon is also a podcaster. His show is The Entertainment Law Update Podcast. Gordon and I discuss Entertainment Law and Intellectual Property Law (copyrights and trademarks). Gordon also has The Law Podcasting Podcast - how to help attorneys create manage and promote their own podcast (I was a guest on that show). Finally, Gordon has a course on how to protect your online course and seminar, as well as a ton of other material on entertainment law and intellectual property law. In this week's episode of the podcast (our last of 2017), I interview Michael Holmes with Delta Credit Restoration, which helps clients with debt settlement and credit restoration. Delta Credit Restoration is unique in that they will only seek to eliminate inaccurate information from your credit report, and they also try to educate borrowers to get better decisions around credit so that their clients don't continue to make the same mistakes that got them into the credit trouble to begin with. In addition, Delta Credit Restoration provides a reasonable alternative to bankruptcy by helping to settle debts that are behind - although they are NOT a debt consolidation company. You can contact Michael at 813-567-5855 or www.DeltaCreditRestoration.com. If you have further questions, please contact me at Shawn@YesnerLaw.com or www.YesnerLaw.com. Have a Happy and Safe New Year and we'll speak to you again in 2018!! In this week's episode, we have a returning guest, attorney Christie Arkovich, discussing student loan forgiveness under the Public Service Loan Forgiveness Program. Christie and I talked in Episode 50 about different ways to eliminate or negotiate student loan debt. Today, we talk about the Public Service Loan Forgiveness Program - which is a 2007 program instituted by President Bush, that allowed student loan borrowers to pay based on what they could afford, and satisfy the debt after a certain period of time (without paying it back in full) if they worked in a public service industry (versus working in the private sector). The problem is that many student loan borrowers are NOT in the program, even though they believe they are, and are being told by the student loan companies that they are in the program! Christie can help if you believe you are in one of these programs, or if you want to see if you qualify for one of these programs. Christie can also help if you have other student loan issues. To contact Christie, please call 813-258-2808, or www.ChristieArkovich.com, or www.TampaBankruptcyLawyer.com. If you have questions for me, you can reach out to Shawn@YesnerLaw.com or www.YesnerLaw.com. This week's guest on the Crushing Debt Podcast is Robin Lavitch with Surpass Your Goals. Robin is a professional coach for businesses, professionals and tweens. Robin and I discuss your relationship with money, and how your mindset determines how much money you have! Do you experience a situation where you always struggle with having enough money, or do you think "I'll always be okay" and money seems to appear when you need it most? This stems from your relationship with money. Robin can help you identify your relationship with money, so that you know what you can change to "get" more money. Nick Raithel is back as a guest on the Crushing Debt Podcast. Nick is back promoting the REI 7-Hour Book, a version of his 7-hour book system to help Real Estate Investors (REI) develop their own 7-hour book. - Create speaking opportunities, and other branding opportunities. To be completely transparent, following this link will benefit Yesner Law in tracking referrals to the REI 7-Hour Book from The Crushing Debt Podcast - but ultimately this opportunity benefits you who want to write a book, but don't have the time to do so. Julie Shopa is a Profit First certified professional and, through her business, Clarity Finances helps her clients with bookkeeping and interpreting the financial health of her clients using the system created by Mike Michalowicz in his book Profit First. The Profit First system focuses on the formula "Sales - Profit = Expenses" rather than "Sales - Expenses = Profit." The system focuses on the adage "pay yourself first." You can contact Julie at Julie@clarityfinances.com, or call her at 610-548-5279, or visit her website at www.clarityfinances.com. If you have questions for me, please email me at Shawn@yesnerlaw.com or visit www.yesnerlaw.com. 74. Episode 89 - Happy Thanksgiving! This is the third Thanksgiving that The Crushing Debt Podcast has been in existence, but this is the first Thanksgiving where I have released an episode. I thought it would be a good idea to talk about what I'm thankful for in 2017. What are you thankful for in 2017? What great things have happened for you in 2017? Who do you want to mention in 2017? Please let us know all the great things that have happened to and for you in 2017. Polly Bauer is the go-to expert for all things credit. After 35 years as a global credit expert, including consulting with major credit card organizations and multi-billion dollar corporations, she believes that credit is the new money. It’s energy. Past President & CEO of Home Shopping Network Credit Corporation, two-time award winning Author of books about credit, International corporate speaker, and Host of Swipe! Podcast. Polly is passionate about helping consumers harness their credit power with sound credit principals and intuitive wisdom. The Crushing Debt Podcast has a great relationship with Polly and with Swipe! The Podcast, and we hope you enjoy this episode. What are some of your tips and tricks for maximizing your Black Friday shopping experience? Let us know at www.Facebook.com/YesnerLaw. You can reach Polly at: www.SwipeThePodcast.com, Swipe! The Podcast on Facebook, or @SwipeThePodcast on Twitter. In this week's episode, I interview Tonya Lonsbury, a realtor with Berkshire Hathaway Home Services. I first met Tonya a few years ago when she worked for a marketing company, but then she left Florida to pursue some other opportunities in Tennessee and Atlanta, GA.
Now, Tonya is back! Tonya has a very strong background and understanding of the home buying and selling process as well as mortgage origination. Tonya's goal is to make sure that you live in a home that makes you happy, that makes you enjoy getting up in the morning, that makes you enjoy your neighborhood and your neighbors. Tonya truly wants to make sure that home is where the heart is. You can reach Tonya at 727-280-6631, or Tonya Lonsbury Realtor on Facebook, or by email at tlonsbury@bhhsflpg.com. My community has a garage sale twice a year and in this Fall's community garage sale, a lesson occurred to me - presentation is everything. In episode 68 of the podcast, I analogized creditor negotiations with negotiating at a Garage Sale. In this week's episode, I share negotiation lessons that I learned from participating in our community garage sale, specifically regarding how an item's presentation impact its sale-ability. Using that analogy, if you are a real estate investor (or in sales of any kind) how are you presenting your properties, how are you presenting your offers, how are you presenting yourself? These are all topics I discuss in this week's episode. If you have any feedback on "presentation" please comment, and if you like the episode, please share with others you know who are in sales. Just a few days prior to Halloween, I get to discuss a scary topic - ZOMBIE DEBT !! Zombie Debt is debt that was eliminated because it is beyond the statute of limitations, it was charged off, it was eliminated in bankruptcy, it was paid off, or something else happened to make it go away, but years later, the debt (through a debt collector) rises from the dead and tries to take money from you to satisfy the otherwise uncollectible obligation. This episode focuses on strategies to finally eliminate Zombie Debt! 79. Episode 84 - Client Success Story! This week's episode is one of my favorites, because I get to share a success story around a client who was being chased (harassed) for over $21,000 related to the repossession of a jet ski. The best part about this story is that I was able to convince the creditor to leave my client alone and drop the debt entirely - from $21,000 owed to $0 owed !! How did I do it? You have to listed to the episode. If you have a creditor chasing you for money and you do not believe that you owe it, or you do owe it but are unable to figure out how to pay it, you do have options other than bankruptcy. Please contact me and we can discuss your situation. In this week's episode of the podcast, I look at the last 9 requests to Freddie Mac to take people off of their Exclusionary List. If you want to hear more about the Exclusionary List, please listen to Episode 32. This episode is about different things I've learned in trying to get people off of the List - my successes and failures. I would appreciate if you would share this episode with a mortgage originator, realtor or title company you know because they are the ones who can refer people who are on the List to me for review, and in this area of the law, I can represent people all over the country! In this week's episode of the Podcast, we talk about debts that are non-dischargeable, meaning these debts are not eliminated by a bankruptcy filing. The episode comes from from a listener question about a debt arising from domestic violence. What other debts do you think are or are not dischargeable? Let us know at Shawn@YesnerLaw.com or www.YesnerLaw.com. In this week's episode, we interview Samantha Dammer, owner of Tampa Law Advocates to discuss Chapter 7 Bankruptcy for businesses. Samantha has been practicing just as long as I have - 18 years as of the recording of the podcast episode, and has been practicing bankruptcy in Florida for 10 years. You can contact Samantha at 813-288-0303 or visit her website at www.tampalawadvocates.com. If you have questions for me, please reach out to Shawn@YesnerLaw.com, or www.YesnerLaw.com. In this week's episode, I welcome my friend Matt Lapointe, an attorney with the firm Blalock Walters in Brandenton, FL. Matt and I were talking recently about the number of clients I have who all fear being taken to prison for failure to pay a debt - called debtor's prison. In fact, debtor's prison no longer exists and so Matt, a self-described history buff researched the issue of debtor's prison and we discuss this history of debtor's prison in this week's episode of the podcast. You can reach Matt at mlapointe@blalockwalters.com or 941-748-0100. Matt focuses on corporate and transactional law (meaning he does not go to Court, although he has attorneys in his firm who do if necessary). I found an interesting article about success rates in Chapter 13, reorganization cases that I summarize in this week's episode. - Should you file individually or jointly with a spouse? - Should you file on your own or with an attorney? - What are the Success Rates on your second chapter 13 (after the first one was unsuccessful). Please let me know what you think of this statistical analysis, and if you want a free copy of the report, please contact me at Shawn@Yesnerlaw.com. In this week's episode, I interview Paul Moore with Wellings Capital, and author of The Perfect Investment. Paul and I discuss strategies to minimize tax liability. As a disclaimer, neither me or Paul are CPA's, Tax Attorneys, or otherwise, but we both have some knowledge and experience with the material. Or you can order his report that forms the basis of this episode on his website, or from Paul directly at Paul@WellingsCapital.com. In addition, check out Paul's Podcast - The How To Lose Money Podcast on iTunes and Android podcast players. In this week's episode of the podcast, I interview Jocelyn Paonita from The Scholarship System. This was one of my favorite interviews. Jocelyn was able to have her entire college education paid for by scholarships. The Scholarship System helps people find scholarships for students at all levels of education, wherever scholarships may be available. Student loan debt is a serious issue in our economy and Jocelyn's example and her systems can help reduce student loan debt before the students actually incur the debt! The Scholarship System helps people find the scholarships, and then they implement strategies to complete the application for the scholarship. You can find more information, as well as Jocelyn's contact information at www.thescholarshipsystem.com. Check out their blog, the free webinar, and all of the other information on the website! This week's episode was recorded during a Referrals for Life social at my house. We talk networking, business generation, referral generation, and something that connects all of us - every speaker on this week's podcast has multiple streams of revenue in addition to their primary business. From my perspective, I always try to align myself with successful and positive people. If you live in the Tampa Bay area and want to learn more about Referrals for Life and joining our community here in Tampa Bay, please contact me (or any of the guests on this week's show). What you'll learn is that the goal of the Referrals for Life community is for us all to live a spectacular life !! In this week's episode of the podcast, we talk about whether a quit claim deed or a quiet title lawsuit can stop a foreclosure, from a listener of the podcast! Many people believe that transferring a home to a third party and then filing a quiet title lawsuit will defeat a foreclosure lawsuit. Unfortunately, under FL law, the answer is "no." How I get to that answer is in this week's episode. This week's episode is Part II of my interview with Bryan Levine of Knox Levine, PA. IN this week's episode, we talk about the different enforcement mechanisms available to Homeowner and Condominium Associations. When can they claim a lien? What are they entitled to collect? In this week's episode, we discuss what happens to surplus funds when someone buys a house at a foreclosure auction. Surplus funds exist when the winning bidder paid more than the amount owed to the bank. This week's episode is a product of another listener question, and is an interesting take on a long-standing Florida Law regarding the association's ability to collect assessments against someone who bus the property at foreclosure auction. What if there are excess funds following the foreclosure sale, but the person foreclosed still owes the association money? Can the winning bidder force the association to take the surplus funds to satisfy the debt owed by the former owner? We're unsure if there is a clear legal answer to the question, but I give the logical answer in this week's episode. Let us know what you think of my answer? In this week's episode, we interview Bryan Levine. Bryan is a partner at Knox Levine, a firm that focuses on representing condominium and homeowner associations. Recently, Florida passed a law known as the "Estoppel Law," Senate Bill 398. This new law governs certain aspects of what an association can or cannot do when issuing an estoppel letters - those letters that associations issue to let the homeowners know what they owe, what assessments are due, and other financial aspects of the property. 4. The Estoppel Letters must be valid for 30 - 35 days. If you are on the Board of the association, or an association management company, reach out to contact Bryan Levine at 727-223-6368, www.knoxlevine.com, or Bryan@knoxlevine.com. If you get a letter from an association and have questions, please send me an email at Shawn@YesnerLaw.com or www.YesnerLaw.com. 1. Can you finance a car while in a Chapter 13 bankruptcy? 2. Can a landlord garnish wages? 3. Does it pay to fight a lawsuit against me seeking $1,200? 4. Is a homeowner entitled to surplus funds following a foreclosure sale? 5. Can sellers change their mind about selling their property? Thank you for supporting the podcast by sending in some great questions. We hope you enjoy the content and please keep the questions coming. If you have questions related to any of the above questions that I answered, please reach out at shawn@yesnerlaw.com, or www.yesnerlaw.com. In this week's episode, we talk about the intersection of bankruptcy and condominium / homeowner association law. Many times, people don't understand that they still owe their homeowner association or condominium association even though they filed bankruptcy. This is because the bankruptcy code says that assessments due post-filing (post-petition) are not dischargeable, or are debts that are unaffected by the bankruptcy filing. What do you think? Should ongoing assessments be dischargeable after the bankruptcy is filed? Let us know at Shawn@YesnerLaw.com or www.yesnerlaw.com. In this week's episode, we interview Richard Ficca, owner of Florida Coastal Insurance. Rich is a friend, referral partner, and mentor. Rich has built a multi-million dollar insurance company. He's been in the insurance industry for over 21 years, 15 of that as an instructor for other insurance agencies. Rich is also an insurance agency valuation expert. - How to document all of the stuff in your home. - What apps you should have on your phone. - Using a thumb-drive to store your personal information. - Why you should buy a $5 power strip. You can contact Rich at www.FloridaCoastalInsuranceAgency.com, or email him at Richard@FloridaCoastalInsuranceAgency.com, or call Rich at 727-569-6000 x 101. We recently had our neighborhood garage sale, and it occurred to me that I could use that opportunity to practice my negotiation skills with very little risk. 1. What is your price (either as a buyer or as a seller)? Know your value and be confident about it. When dealing with a creditor, know your financial information, so you can be confident in the settlement offer to the creditor. 2. There is value in taking less or compromising - a value to "not put it back in the garage." When settling debt, there is a value to getting the creditor to go away, even if the creditor is asking for more than what you want to pay. What is the opportunity cost inherent in settlement? What is the emotional value to settle? If you have questions regarding debt settlement, please contact me at Shawn@YesnerLaw.com or www.yesnerlaw.com. In this week's episode, we interview Tom Wolf, a business coach, author and speaker here in the Tampa Bay area. Tom's business excels at helping business owners to leverage themselves, so they can work on their business instead of in their business. Tom has an interesting and diverse background. He has owned an IT Staffing Company, 10 Great Clips Franchises. Tom has a lot of experience in building and selling companies. Now Tom focuses on finding your purpose and has a 7-step program to answer the question, "who am I and why am I here?" Tom also has a work-book related to his coaching program. 97. Episode 66 - Can I Rent My House if it is in Foreclosure? Another week, another listener question. In this episode we answer a realtor question: "How does someone rent out a house in Foreclosure? Is this a scam? It is in the MLS"
Interestingly, this is not, necessarily, a legal question. It may be a moral question. What do you think? Let me know if you think it should be proper to rent out your house while the house is in foreclosure. In this week's episode, we answer a question from a listener in Colorado. "I no where near the point of bankruptcy, but my husband and I have a lot of debt and are treading water trying to stay afloat most of the time. Any tips on consolidating debt or getting things paid off quickly for the self-employed." First, the laws are different between Colorado and Florida. Second, what type of debt are we dealing with - unsecured debt, secured debt, student loans, IRS, credit cards, hospital bills, etc.? In this episode, we answer the listener questions with some tips on consolidating and ultimately crushing your debt. Please share this episode on social media if you enjoy the content! Would you like to write a book in seven hours or less? Do you want a system to get a professionally-published book in seven hours or less? This week's guest is Nick Raithel of The Seven Hour Book. Nick can put together content, create graphics, help with publishing, and anything else necessary to get a book completed that you write! So how does this have to do with Crushing Debt? Writing a book will position you as a leader in your industry, thus generating direct revenue (from book sales) or indirect revenue (through search engine optimization, speaking engagements, etc.). In addition, providing material through a published book is a way to give back to the community by sharing information. You can reach Nick by going to his website www.contentcorps.net. If you have questions about becoming a published author in 7 hours or less, please contact Nick. If you have questions that I can answer, please contact me at www.YesnerLaw.com. If you want more information about our upcoming book, Crushing Debt, please email me directly at Shawn@YesnerLaw.com with the subject line "Crushing Debt Book." Episode 63 of the Crushing Debt Podcast is our interview with Juliet Kyes of ActionCOACH Tampa Bay. One way to eliminate debt is to work with a business coach and ActionCOACH Tampa Bay is one of the best, not only in the Tampa Bay area, but also within the ActionCOACH Franchise. - The Five Ways, which is an ActionCOACH system designed to help increase results in business. - The ActionCOACH library of materials. In this week's episode, we explain the difference between an Eviction, and Ejectment and an Unlawful Detainer lawsuit. Sometimes, landlords and even Courts and attorneys confuse the difference between the three types of cases. All three types of lawsuits accomplish the same goal - getting someone or something off or out of the owner's property. However, how we get there is different for each type of lawsuit. In this week's episode of the Crushing Debt Podcast, we interview Andrew Gordon with Reliable Claims Adjusting. Andrew is a Public Adjuster - meaning he works for the insured (the homeowner) versus the insurance company. Andrew is the insured's advocate against the insurance company to maximize recovery when there is a loss that is covered by insurance. In this week's episode, we discuss some things people can do to protect themselves either before or after a loss has occurred. Andrew also discovers a few of his success stories. To contact Yesner Law, please email Shawn@YesnerLaw.com or www.YesnerLaw.com. I polled a group of about 100 FL Realtors on which residential real estate contract is better for Buyers or Sellers, the "As-Is" Contract or the Repair Limit contract. The answers are in this week's Crushing Debt Podcast! I regularly speak at BABA (Become A Better Agent) for Insured Title Company. The last time I spoke, we debated the pros and cons of the two versions of the Florida Real Estate Contract in use by most FL Realtors. The "As-Is" contract gives the buyer the right to cancel the contract after doing inspections, if the Buyer finds that the property is not acceptable. The "Repair Limit" contract allows the seller to fix the property up to a certain repair limit. If the repairs exceed that limit, either party can cancel the contract, or the Buyer can agree to make repairs in excess of the dollar repair limit. Which do you think is better for Sellers? Which do you think is better for Buyers? Episode 59 of the Crushing Debt Podcast is a great interview with Jason Crawford. Jason's company is called Fierce, Inc., and they help clients with visual marketing. Fierce, Inc. takes your message, your vision and mission, and describes those things visually, to create more engagement with your customers, clients, referral sources, and the general public. We talk about social media, Facebook Live, content creation, and other engagement topics. To contact Jason, visit his website at www.wearefierce.net or JCrawford@wedarefierce.net, or his phone number is 813-789-5773. To contact us, please email Shawn@YesnerLaw.com or www.YesnerLaw.com. In Episode 58 of The Crushing Debt podcast, we discuss a case called In Re: Failla. This case impacts both bankruptcy and foreclosure cases in Florida, and was a win for lenders, against homeowners and borrowers. Mr. and Mrs. Failla bought a house in Boca Raton, Florida. Eventually circumstances caused them to fall behind on their mortgage and the bank filed a foreclosure. The Faillas then decided to eliminate their debts in bankruptcy, including stating their intent to "surrender" their house to the mortgage company. However, when the bank proceeded to foreclose, based on the Failla's intent to surrender the house, the Faillas fought the foreclosure case. The bank objected to the Failla's actions. The case found its way to the 11th Circuit Court of Appeals in Atlanta, GA (which governs bankruptcy and Federal Court cases in Florida, Georgia and Alabama). The decision is from October 2016 and now, unfortunately, means that when someone in bankruptcy indicates an intent to "surrender" the house, they're no longer allowed to later defend the foreclosure case. Do you agree with the Court's decision? Please let us know at Shawn@Yesnerlaw.com or www.yesnerlaw.com. Regular listeners to the Crushing Debt Podcast know that we are HUGE fans of AFLAC. In this week's episode, we interview Brian Morris, We talk about a very personal story about why Brian became an AFLAC Agent. AFLAC helps people with short term disability for accidents, cancer, and other situations. AFLAC pays money to bridge the gap between the promise of health insurance, and the protection of health insurance. Not only is Brian responsible for helping business owners and individuals obtain AFLAC, he is also responsible for growing his AFLAC team here in the Tampa area. If you are interested in AFLAC, either to purchase a policy or become part of Brian's team, please contact him at 727-492-9960 or David_Morris@us.AFLAC.com (Brian's first name is actually David). To contact us, please reach out at Shawn@Yesnerlaw.com or www.yesnerlaw.com. In Florida, there is a committee made up of 10 Realtors and 10 attorneys that get together every few years to review the standard form contract in use by most residential real estate agents in Florida. The contract is called the FAR/BAR (Florida Association of Realtors / Florida Bar). The intent of the contract is to provide a fill-in-the-blank form for Realtors to use to avoid an allegation of the unlicensed practice of law. What are the duties of Buyer and Seller with respect to expired or unpermitted work; The location of the closing; Changes to the financing contingency, including a definition of the phrase "diligent effort;" and Approval to obtain notice if the Buyer does, or does not, obtain financing. This is not an exhaustive list of all the changes. If you have questions about interpretation of the revised FAR/BAR, or any real estate contract, commercial or residential, please reach out to us at Shawn@YesnerLaw.com or www.yesnerlaw.com. In Episode 55 of the Podcast, we interview Marielis Rivera, a personal injury attorney with the firm of Pipas Law Group. Like me, Marielis started on the "other side" representing insurance companies being sued by injured parties. Now, however, Marielis represents only injured parties. Many times, injured parties are unable to work because of their injuries and, when income drops, there is a ton of stress in addition to their injuries. Marielis does a great job of informing her clients of their options and helps her clients to manage their debts until the lawsuit is over. You can contact Marielis on her cell phone at 813-509-6606, or on Facebook. You can contact us at Shawn@Yesnerlaw.com or www.yesnerlaw.com. We would appreciate if you would leave a positive review of the Crushing Debt Podcast if you enjoy the content, and ask a friend to subscribe and listen to our weekly episodes! In this episode of the podcast, we talk about a former client and an aggressive strategy we used to eliminate a potential mortgage deficiency. The client was divorced and her ex-husband kept the property. The problem for our client was that she was still on the Promissory Note and Mortgage. The divorce did not (and can not) eliminate her liability to the lender under the promissory note and mortgage. Years later, the husband passed away and the bank, in this case a credit union, pursued the ex-wife for foreclosure. Credit Unions never (in our experience) waive deficiency, so our client was still financially responsible to pay any deficiency to the Credit Union. The client did not qualify for Chapter 7, so we filed a Chapter 13 reorganization (or payment plan) bankruptcy, with the hope that the Credit Union failed to file a claim in the bankruptcy case (meaning the Credit Union would not get paid). It is an aggressive strategy because if the Credit Union had filed a claim in the bankruptcy case, they would have been entitled to payment and the payments to the bankruptcy court would have been unaffordable. We hope you enjoy this week's episode. If you have questions about how we were able to help her and why it is an aggressive strategy, please listen to the episode, or send us an email - shawn@YesnerLaw.com or www.YesnerLaw.com. 110. Episode 53 - What Laws Ended in 2016? Welcome to Year 2 of the podcast. As you have seen from previous episodes, we have re-branded the podcast and it is now The Crushing Debt Podcast, where our goal is to help you eliminate the financial bullies in your life. This week's episode is a review of the different laws that expired at the end of 2016, and some new case law that impacts foreclosure defense in 2017 and going forward, unless or until the Supreme Court makes a conflicting decision. What did we lose? HAMP which helped with modifications, HARP which helped with refinances, HAFA which helped with short sales, and the Mortgage Debt Relief Act, which made mortgage and foreclosure deficiencies non-taxable. In addition, we discuss the Bartram case, which has a huge impact on foreclosure law here in Florida. We hope you enjoy the content, and we ask that you share this post and episode if you think the content has value! Welcome to the last episode of the first year of the podcast! In this week's episode, we have a repeat guest, Jason Avery of Avery Construction and Constructing Debt. However, in this episode of the podcast, we talk to Jason about Room Full of Referrals provided by Jason through the company, Asentiv. In Room Full of Referrals, we learn that people are faster paced or slower paced, people oriented or task oriented. The seminar is highly useful in determining your own style, learning the behavioral style of other people, and how to use that information to better connect, and generate better referrals. Jason was my jury consultant a while back and used his behavioral style analysis to help me pick the right jury and win my case! I also utilize tactic learned in Room Full of Referrals to better connect with potential clients and customers. In Room Full of Referrals we learn the Platinum Rule. Everyone knows the Golden Rule - treat others the way you want to be treated. The Platinum Rule is to treat others how they want to be treated. To reach me, please email Shawn@YesnerLaw.com or www.YesnerLaw.com. As this is Episode 52, we want to continue to provide value to you, our listeners. Please let us know what you like about the podcast, what we can improve about the podcast, and what you want us to keep the same about the podcast. In this week's episode, we interview attorney Kelly Petry. Kelly and I discuss issues with Student Loans. Kelly and I discuss whether student loans are dischargeable in bankruptcy court, how student loans are treated in bankruptcy court, and some things that we can do in bankruptcy court to address the debtor's student loans. In certain circumstances, student loans are dischargeable. In Tampa, we utilize the Brunner Test to determine whether a student loan can be eliminated by the bankruptcy court. However, there is a very high standard to discharge a student loan in bankruptcy court. The Brunner factors are: (1) debtor cannot maintain a minimal standard of living if forced to repay the loans, (2) there are additional circumstances that show the debtor's financial condition is going to persist for the foreseeable future, and (3) that the debtor has tried to repay the student loan. While the standard is high, there have been some inroads and Congress is currently trying to determine if they can provide additional assistance to people trying to repay their student loans. To contact Kelly, please call her at 813-873-0713. If you have questions, please email me at Shawn@Yesnerlaw.com, or www.yesnerlaw.com. Please also share this podcast episode if you found it valuable! Student loan debt is becoming unduly burdensome. Student loan debt is quickly becoming the biggest area of debt for borrowers who are having trouble making their monthly obligations. Christie and her firm can help people eliminate or negotiate student loan debt that was taken out by a parent or co-borrower for the student, or for schools that have closed. In addition, outside of bankruptcy court, there are other options to help students eliminate, reduce or negotiate their student loans. Of course, if the borrower can prove "undue hardship" those cases may be dischargeable in bankruptcy court, but that is a high standard and rare. As you will hear there are many other avenues available to help people negotiate or eliminate their student loan debts, under various federal programs. We appreciate Christie being on the podcast. We have referred her clients who have been very happy with her services. Christie offers free consultations and phone consultations. To reach her, please call 813-258-2808 or www.ChristieArkovich.com, www.TampaBankruptcyLawyer.com. Check out her student loan survival package on her website! If you have questions for me, or other topics that you would like to hear on the podcast, please contact me at Shawn@Yesnerlaw.com or www.YesnerLaw.com. 114. Episode 49 - Will Foreclosures Increase in Florida? In Episode 49 of the Podcast, I discuss the case Bartram v. US Bank National Association, which was decided by the Florida Supreme Court in November 2016. Bartram is a significant decision in Florida because the FL Supreme Court holds that the bank can file a second foreclosure case, after dismissing its first foreclosure case, even if the date that the borrowers stopped making payments is beyond Florida's five-year statute of limitations. For whatever reason, some banks decide to dismiss foreclosure cases when those cases have a technical deficiency (ownership of the promissory note for example). If it took the bank too long to fix that issue, so that the date of default became more than five years old, some courts in Florida held that the bank could not foreclose again (because the default date was more than 5 years old). Bartram reversed that line of thinking and, because it was decided by the Supreme Court of the State of Florida, that is now the "law of the land" in Florida. The Court did say that any payments that were past due more than 5 years are uncollectible as being beyond the 5-year statute of limitations, but the foreclosure itself could proceed as long as the bank alleged a default date that was within the five years - meaning the bank would simply waive any late payments that are more than five years past due and continue their foreclosure. Already we've seen a slight increase in foreclosure filed under these circumstances. To learn more, please visit our website at www.yesnerlaw.com. Or if you have questions, please email me directly at Shawn@Yesnerlaw.com. Also note we are changing the name and branding of the Podcast to Crushing Debt. You'll hear the name change in Episodes 53 and beyond. We've updated the logo with this episode and would appreciate any feedback! In this Episode of the podcast, we have our friend Tiffanie Kellog back for an interview. Tiffanie has a new book out, Knock the Socks off your Audience, to go along with her first book 4 1/2 Networking Mistakes and its accompanying workbook, Networking for Results. In this episode of the podcast, Tiffanie turns the tables and interviews me on what makes a good referral for Yesner Law, using some of the techniques she writes about in her books. You can find and order Tiffanie's books on Amazon. If you want to contact me, you can email me at Shawn@YesnerLaw.com or visit the website at www.yesnerlaw.com. Please leave a review or comment if you enjoy the content. 116. Episode 47 - Show Me The Money!! In this week's episode of the Podcast, we again interview our friend Loren Pincus. In addition to being a personal injury and criminal law attorney, Loren is also a sports agent for Minor League Baseball. Loren has a few clients who may get called up to the big leagues, moving Loren to the big leagues as an agent himself. While Loren is a fantastic attorney, you can hear in his voice that being a baseball agent is his true passion. This was one of my most interesting interviews and one I enjoyed the most. Loren talks about what it takes to be a sports agent, particularly in Minor and Major League Baseball. You can learn more about Loren at www.GreenLineSportsManagement.com, or follow him on twitter @Greenlinesm. If you have any questions, you can email me at Shawn@YesnerLaw.com or visit our website at www.YesnerLaw.com. When a small business owner files bankruptcy, their company becomes an asset of the bankruptcy case. Therefore, the business owner needs to evaluate the value of the business. Some business owners want to say that their small business is worth nothing because if they don't work, the company doesn't make money and is worth nothing. However, the bankruptcy judges and trustees in Tampa will not accept that argument, because the business has value. What would a competitor pay to buy the business? What is the value of the assets of the business? What are its receivables? What are its revenues? Its profits? In this episode of the podcast, we review all of these different valuation techniques in connection with business owners who want to file personal bankruptcy. If you have questions that you think would make a great future episode, please let me know at Shawn@YesnerLaw.com. You can also visit our website at www.yesnerlaw.com. In this week's episode, I have a conversation with Tyler Sheff of The Cash Flow Guys. Tyler is a real estate investor, coach, consultant, podcast host, and most importantly a friend and mentor to me personally. Tyler is one of the real estate investors that does it right. He always looks for a win-win scenario and coaches his students in the right way to buy and invest in real estate (i.e. without taking advantage of anyone). Tyler refers customers, clients and investors to Yesner Law and we very much appreciate the referral relationship we've created with The Cash Flow Guys. We recently acquired equipment that allows us to conduct podcast interviews by skype and Tyler was kind enough to be a guinea pig. This episode is the result. We hope you enjoy the content, and visit Tyler's website for more information. I can always be reached at shawn@yesnerlaw.com and www.yesnerlaw.com. Typically, people dealing with foreclosure, bankruptcy or short sales are concerned about the impact those things may have on their credit. We focus on taking the mystery out of your credit score, so that you can focus on eliminating the potential liability to the creditor. However, understanding what makes up a credit score will help when facing foreclosure, bankruptcy or short sales, even though credit does recover quickly. We discuss these factors in detail in this week's episode of the podcast. If you have questions we can answer in future episodes, please contact us at Shawn@Yesnerlaw.com or www.yesnerlaw.com. In this week's episode of the Podcast, we interview attorney Loren Pincus, with the firm Yanchuck, Berman, Wadley, Zervos & Thomas. Loren focuses on Criminal Law and Personal Injury Law. What should you do if you're involved in a car accident? In this week's episode, Loren answers this question, as well as other questions like Uninsured or Underinsured Motorist Coverage, Bodily Injury Coverage, PIP Coverage, and Florida's recent law change that requires someone involved in a car accident to see a doctor within 10 days of the accident. You can reach Loren by email at LPincus@YanchuckBerman.com, or visit the firm's website , Loren's Facebook Page, or Twitter. You can also call Loren's cell at 727-599-1579. We hope you enjoy this episode and if you have questions that would make good future episodes, please contact me at Shawn@YesnerLaw.com, or visit my website. Bankruptcy Chapter 6.5 is a term of my creation and it references a situation where a homeowner files Chapter 13 bankruptcy to save their home through a mediated loan modification, but then dismisses the bankruptcy once the modification is completed - thus completing half of a Chapter 13 reorganization (13 divided by 2 equals 6.5). Recently, I posted a blog article and related podcast that asked the question "Why is Bankruptcy so Odd?" In that article, I never discussed Chapter 6.5. You won't find Chapter 6.5 in any bankruptcy law book, code book, or rule book. You won't even find it amongst any slang around the courthouse (unless, of course, this podcast episode and its related blog go viral). Today's episode covers when this might be a good strategy for someone in bankruptcy or foreclosure, and also covers why this strategy exists in the first place - it has to do mostly with the way payments are accepted and applied by the Chapter 13 Trustees here in Tampa, Florida. We hope you enjoy this episode. If you have any questions, or if you have topics that you think would make a great future topic, please contact me at by email at Shawn@Yesnerlaw.com, or visit the Yesner Law website. After a Thanksgiving Break, we're back! In this week's episode, we interview Attorney Nick Ekonomides again, but this time on the issue of commercial foreclosures. Commercial Foreclosures are different than residential foreclosures. Many of the defenses available in a residential situation are unavailable to the commercial defendants. In addition, other issues like assignment of rents and receivers often come up in commercial foreclosure litigation. If you enjoy this content, please let us know. If you have questions that would make good future podcasts, please contact me at Shawn@Yesnerlaw.com or www.yesnerlaw.com. In this week's episode of the podcast, we discuss bankruptcy and why it is broken into all odd-numbered chapters, except for one even-numbered chapter. We also go into a little detail about the differences between all of the bankruptcy chapters. We hope you enjoy this week's episode. Please let us know if you have any questions, comments or topics you want us to cover in future episodes. In this week's episode of the podcast, we interview Matt Friesz with Properly Inspected Home Inspection. When buying a house, we HIGHLY recommend obtaining a home inspection and Matt is one of the best in Tampa Bay. We discuss what a home inspection covers and what it doesn't cover. We discuss what types of inspections Matt performs; he can do inspections for home buyers, home sellers, insurance purposes, and for other reasons. There's even a horror story or two in this week's episode. To contact Matt, please visit his website: www.properlyinspected.com. In this week's episode, we interview Nickolas Ekonomides, who practices in civil litigation. Civil litigation and Nick's practice primarily focuses on disputes between businesses that owe money or are owed money. Nick and I discuss non-compete agreements, exclusivity agreements, and other issues that cause disputes between business owners or landlord / tenant. To reach Nick, you can visit his website at www.Eko-Law.com. If you have questions, you can reach me at Shawn@Yesnerlaw.com, or www.yesnerlaw.com. In this week's episode, we interview Barb Hennessey with The Joy Within, a company that uses somatic intuitive training to help people release and recover from their emotional stresses. Barb can help people who have any type of emotional pain or trauma: the loss of a loved-one, PTSD, financial trauma. This is where Barb overlaps with Yesner Law; she can help people who are upset at their current financial situation, where we can help people keep their creditors at bay, or eliminate those creditors entirely. Barb's contact information is 727-409-7428, www.TheJoyWithin.US, or Barb@TheJoyWithin.US. For Yesner Law, please contact us at Shawn@YesnerLaw.com or www.yesnerlaw.com. 127. Episode 36 - What Happens When Only One Spouse Files? We come across situations often where one spouse wants to file without involving the other spouse. Maybe one spouse carries the debt. Maybe the parties are divorcing. The questions I get most often are: (1) can I file alone? (2) what happens to the debt of the other spouse? (3) how else will my spouse be affected. Sometimes this also comes up in situations where one roommate wants to file, and I've even had this happen a few times where the parties are in a relationship (whether straight or gay) and the question is "how does this affect my significant other?" The answer is that it really won't affect the non-filing party. We explain further in this week's episode of the podcast! If you have questions, please contact me by email at Shawn@YesnerLaw.com, or on my website, www.yesnerlaw.com. In this week's episode of the Yesner Law Podcast, we interview David Rosenthal, who is a commercial real estate agent here in Tampa Bay. David has accounting experience and experience with helping his clients review a commercial real estate deal to see if it is a good fit for the client's needs. Commercial and Residential real estate are really two completely different things. Most residential realtors know nothing about commercial real estate. If you'd like to contact David, please call 813-245-7333. David@GrimaldiCommercialRealty.com. If you have questions that would make a great future episode, please contact us at Shawn@yesnerlaw.com or at www.YesnerLaw.com. Hello Yesner Law Podcast listeners. This episode is all about Wells Fargo and Bankruptcy. I wrote a blog about this topic below. For this week's episode, I simply read the blog post because I think the content is still good and accurate. I hope you enjoy. If you have questions or ideas for another episode, please contact me at Shawn@yesnerlaw.com or www.YesnerLaw.com. Each night, as we sleep, Wells Fargo combs the Federal electronic database of all new bankruptcy filings looking for a customer that filed Chapter 7 bankruptcy. When that happens, WF freezes the clients checking and savings accounts, thus denying the depositor access to his money. The apparent authority for Wells Fargo to do this comes from a United State Supreme Court Case, Citizens Bank of Maryland v. Strumpf, 516 U.S. 16 (1995). In that case, the Supreme Court ruled that a deposit account is "nothing more or less than a promise to pay, from the bank to the depositor" and the bank's "temporary refusal to pay was neither a taking of possession of ... property nor an exercising of control over it, but merely a refusal to perform its promise." Accordingly, the Court ruled that the freeze was allowed and did not sanction the bank for its conduct. Wells Fargo banking customers who live in the Tampa Bay Area and other areas comprising the Middle District of Florida will have to do some pre-bankruptcy planning. The most logical strategy is to move the money from a Wells Fargo bank account to another bank (as of the writing of this article, Wells Fargo is the only bank that imposes this account hold.) Another possible strategy is to remove sufficient case funds to cover regular expenses until such time as the Chapter 7 Trustee has an opportunity to review the schedules and send notice to Wells Fargo that the hold can be removed. Although this process normally takes a few days, it could take up to 30 days or more. Both of these strategies will have an impact on a debtor's bankruptcy petition and must be disclosed within the schedules. Thus having experienced legal counsel is a necessity when making a determination whether bankruptcy is the best option. Episode 33 of the podcast features our friend Tanya Cielo of Sky Strategic Marketing, a full service marketing agency based in Tampa Florida. The Sky team specializes in helping business owners soar above their competition and claim their unfair share of business in the marketplace! Tanya helped me with a presentation titled "Avoiding the Business Card Graveyard." In this episode, Tanya and I discuss tips and techniques for working a networking event and turning those business cards you collect into relationships, rather than letting them slip into a desk drawer forever. If you have questions or comments for me, visit our website at www.yesnerlaw.com or email me at Shawn@Yesnerlaw.com. The process is fairly one-sided. When Freddie Mac perceives someone should go on the list, they send a letter giving the party 30 days to respond. If they fail to respond, or Freddie Mac rejects their response, the person or entity finds themselves on the list. They can apply to come off the list two years after being on the list and then annually thereafter. The challenge is that Freddie Mac will not explain how to come off the list, nor why a request to come off the list was approved or rejected. Yesner Law has helped many real estate professionals come off the list and, in this episode, we describe our experiences (both successfully and unsuccessfully) with the Freddie Mac Exclusionary List. If you have questions, please contact us at Shawn@YesnerLaw.com or www.yesnerlaw.com. Recently, I posted a blog article titled "Your Attorney's Biggest Frustrations." That post flowed from an idea that I recorded, which became this episode. Why is it important to manage our clients' expectations? What can we do for clients, and what are we sometimes unable to do for clients? Our goal is to eliminate our clients' financial bullies. It would be difficult to do that if we become another of those bullies! Therefore, clear communication and realistic client expectations are key. We've taken on work where we may have faced a legal or factual uphill battle because our client had clear goals and expectations. Conversely, we've declined work where we had a good chance at prevailing, because a "win" in court would have poorly translated to the "win" the client was seeking by hiring us. What are some other thoughts you have about client expectations in managing the relationship between you and your lawyer? We would love to hear your comments. You can also contact me at Shawn@YesnerLaw.com, or www.YesnerLaw.com. In this week's episode, we interview Kerry Kott with Pure Elements Healing. The intent of the podcast is to provide information to help relieve people from their financial stresses and bullies. Pure Elements Healing helps to relieve every day stresses, and makes their clients feel safe and secure. Pure Elements Healing offers a variety of stress relief services, including Acupunture, Facial Rejuvenation, Food Healing and Coaching, Essential Oils, Meditation, Yoga, Cupping (made famous at this year's Olympics), and Ear Seeds. Kerry can be reached at www.pureelementshealing.com. If you have questions or feedback on the podcast, please leave a review or contact us at Shawn@YesnerLaw.com or www.yesnerlaw.com. In this week's episode of the podcast, we talk about different questions a debtor may receive from the bankruptcy trustee. We've covered hundreds, maybe thousands, of these types of creditor meetings over our career and we're pretty comfortable that we've heard almost every question the trustee could ask.While the episode does not contain everything the trustee will ask, it does hit the major points. We would enjoy reading any comments or questions you have on this or any episode of the Podcast. You can reach me directly at Shawn@YesnerLaw.com, or visit the website at www.yesnerlaw.com. In this week's episode of the podcast, we describe situations where someone who has filed bankruptcy in the past has to file again for the second or third time. In this week's podcast, we discuss a couple of other related issues around the same topic. If you enjoy this week's episode (or any previous episode) please review us and rate us on iTunes, Stitcher or your podcast player app. You can reach us at Shawn@YesnerLaw.com or www.YesnerLaw.com. In this week's episode of the podcast, we interview Sara Chiarilli, owner of Artful Conceptions, LLC. Sara is an interior designer, which means that she has a degree in interior design, versus an interior decorator who is someone without a degree who may have an eye for decorating (or maybe not). What are some other differences between Interior Design and an interior decorator? What can Sara do in a Commercial Space as opposed to a Residential Space? How does Sara help with a room remodel? Find out in this week's episode! Sara can be reached at her website: http://www.artfulconceptions.net/, or on her cell phone is 941-539-4322 if you have any questions. If you have questions that you think would make a good future topic, please email me at Shawn@YesnerLaw.com or www.YesnerLaw.com. Episode 26 of a weekly podcast means we're half-way to one year's worth of episodes! We appreciate the support of our listeners! In this episode, we answer a question from one of our listeners! Our listener, Tyler, bought property at a foreclosure sale of a junior lien (second mortgage, condo association, etc.). Now the first mortgage is foreclosing to take the house away from the investor. What can our investor/buyer do to protect himself? 2. Get the former homeowner's cooperation and negotiate a short pay off with the foreclosing lender. One other option is to rent the house for as long as possible to recoup as much of the investment as possible, until the bank finally forecloses and takes the house away. If this is a solution then notice must be given to the tenant so that they are not surprised by a subsequent foreclosure sale. The title of this podcast, "Lien Priority" comes from the system of determining which lien is first in line. What allows the first mortgage to foreclose even after the second mortgage or homeowner's association has foreclosed? Why can the second mortgage or other junior lien foreclose without naming the first mortgage in its foreclosure action? Why do none of these include the County Property Tax Collector in their foreclosure actions? The answer is based on the concept of lien priority. The great Benjamin Franklin is famous for saying, "An ounce of prevention is worth a pound of cure." That is likely the best advice in this situation in that foreclosure sales are "buyer beware." Therefore, doing your due diligence BEFORE buying the property could prevent issues or losses like the one described by our listener. We appreciate the question and have more that we'll be answering in future podcasts, and on the blog (http://www.yesnerlaw.com/blog). Of course, we would enjoy answering more of our listener's questions, so please email those to Shawn@Yesnerlaw.com. This week, we interview Kelly Jenkins, who helps with merchant services - in other words, credit card processing. Kelly sells the technology and point of sales systems (POS) for companies that want to take credit card payment (Yesner Law does take credit card payments, FYI). Kelly has a great story about how she got her job in Merchant Services, and using her sales skills to create two careers - merchant services and direct product sales. Kelly's hidden litter box business was designed to solve a problem that Kelly had related to her pet cats, and provides decorative furniture to cat owners to hide the litter box, and the smell created by the litter boxes. If you have questions that you think would make a great podcast, please email me at Shawn@YesnerLaw.com, or visit the website at www.yesnerlaw.com. In this week's episode of the Yesner Law Podcast, I discuss the Mortgage Debt Relief Act ("MDRA"). This law provides that forgiveness of debt income, or phantom income, related to the foreclosure or short sale of a primary residence is non-taxable if the loan deficit that is waived is related to a loan used to buy or make improvements to the house. When you complete a short sale or lose a house to foreclosure, the bank may choose to waive the deficit - the difference between the amount owed on the loan and the value of the house. The IRS sees that as a benefit (a debt that is due but does not have to be repaid). The bank reports this by issuing IRS Form 1099-C. Many people misunderstand that the MDRA only excludes the income, the MDRA says nothing about the issuance of the Form 1099-C. What I explain to clients is that they need to file the form 1099-C with their return, AND file the proper forms to show the IRS the deficiency is excluded as income. Of course, the mechanics of how to do that fall within income tax guidelines and so we refer to a CPA or Tax Attorney at that point. The MDRA is set to expire on December 31, 2016. It is our guess that the law might not be extended into 2017, but that may also be reliant upon the outcome of our upcoming presidential election. Stay posted to our website (www.yesnerlaw.com) or email me at Shawn@YesnerLaw.com for details on the MDRA as they develop. In this episode, we interview Kathryn (Katie) Davis with AFLAC. Oftentimes clients come to us because of a major medical issue that drains their funds. If the medical incident is severe, it may create a shortfall in the budget causing the mortgage, credit card bills and other debts to fall behind. Plus, hospital and doctor bills are often a major factor causing people to file for bankruptcy. AFLAC provides short term relief. Katie and I discuss the advantages of AFLAC, why someone may want to purchase AFLAC, and how AFLAC will provide some relief when a major (or accidental) medical procedure is necessary. Katie can be reached by email at Kathryn_Davis@us.aflac.com. If you have questions for Yesner Law, please contact us at Shawn@YesnerLaw.com, or visit the website at www.yesnerlaw.com. Welcome back to another episode of the podcast. We try to keep each episode to a maximum of 10 - 12 minutes and last week's topic was too big to squeeze into one episode, and we will likely devote more episodes in the future. In Part 1, we discussed those investors who want to flip properties to create cash. In this episode we discuss real estate investor strategies for those clients who want to buy and sell contracts. We also talk about strategies to buy and hold property, to build wealth. If you are a real estate investor with questions, please contact us at Shawn@Yesnerlaw.com, or visit the website at www.yesnerlaw.com. 142. Episode 21 So You Want to be a Real Estate Investor? This episode of the Yesner Law Podcast is dedicated to our real estate investor clients. In this episode we discuss real estate flips or simultaneous closings. Where can investors get in trouble with these types of deals? How can real estate investors protect themselves in these types of transactions. Please also check out a friend of the lawfirm, Tyler Sheff, with The Cash Flow Guys and his podcast. You can find Tyler at www.CashFlowGuys.com. Tyler is one of the real estate investors that we think does things properly and his podcast is devoted to helping new, and experienced, real estate investors. This is Part 1 of two podcasts devoted to this topic. Please check back next week for Part 2. As always, if you have questions on this topic or any future topic, please email me at Shawn@Yesnerlaw.com or visit our website at www.yesnerlaw.com. You can also find us on Social Media on Facebook, Linkedin, Google+ and other social media sites. In this episode of the podcast, we talk with probate attorney Cristin Silliman regarding what happens when someone dies without a will. We seem to be losing many of our favorite artists and actors in 2016, and surprisingly many of them pass away without a will. This leads to infighting between family members over an estate that could be worth millions of dollars. Cristin helps clients plan for the inevitable, to keep your family secure in knowing what happens to your stuff when you pass away. Cristin is the owner of The Legacy Law Firm, LLC in Oldsmar, Florida. Cristin graduated from Florida Coastal School of Law in 2007. She initially worked as an Assistant State Attorney in Clearwater, FL before opening her firm. Cristin's website is http://www.thelegacylawfirmllc.com and she can be reached by email at cristins@thelegacylawfirmllc.com. You can contact us at www.YesnerLaw.com or Shawn@YesnerLaw.com, and please visit our Facebook and other Social Media pages. Thank you for listening to the Podcast, and we would very much appreciate if you would leave a positive review or comment if you enjoy the content. Thank you for your patience as we migrated the Yesner Law Podcast from one platform to the next. All but our first podcast episode migrated from one website to the other, so we are re-releasing Episode 1. In this first episode of the podcast, we look back on the "Speedy Foreclosure Law" that was passed by the Florida Legislature, and how that has impacted foreclosure law in Florida. Have foreclosures sped up? Has the new law helped, hurt or had no impact? If you have questions, please email me at Shawn@YesnerLaw.com, or visit our website at www.yesnerlaw.com. Description: Did you know that there is a difference between a mediation in a foreclosure lawsuit and a mediation in every other type of lawsuit? Unfortunately, the foreclosure mediation process in Florida has become tainted to the point where it is really just an analysis of whether the borrower has produced documents to the lender. There is rarely a decision or agreement that is reached at a foreclosure mediation. While settlement is never guaranteed in mediation, I have never had a foreclosure mediation result in settlement on the day of mediation, except for one case where the lender was a credit union. For questions about the mediation process, or foreclosures in general, please email me at Shawn@YesnerLaw.com, or visit the website at www.yesnerlaw.com. 146. Episode 18 Why File Bankruptcy? Description: In episode 18 of the podcast, we discuss bankruptcy. What are the reasons that someone might want to file? What are some issues a debtor might encounter? We've posted other episodes of the podcast that deal with specific bankruptcy issues, and have more planned. This episode, however, is a bit more generic. We would love your feedback on the podcast in general, or on this episode, and please connect with us on Facebook, Google+ or Linkedin. If you have specific questions, please contact me at Shawn@YesnerLaw.com or www.YesnerLaw.com. Description: In this week's episode of the podcast, we talk about how I use systems to structure a client's experience with the office, based on lessons I learned while running. In 2014, I was diagnosed as pre-diabetic and my sugar levels were dangerously high. Those who know me, know my fear of needles, so it was easy to start a diet and exercise regiment to ward off high cholesterol, high sugar and the results that come with them. I enjoy running 5 and 10k races (and now include swimming laps training for a triathlon) because the time alone helps me to think about ways that I can improve processes here at the office. The time helps me think about the importance of setting goals and measuring my results. I appreciate your indulgence in deviating from the legal podcast content for one week and I hope you enjoy this episode. If you have topics that would make good content, please email me at Shawn@YesnerLaw.com, or visit the website at www.yesnerlaw.com. Also connect with me on Facebook, www.facebook.com/yesnerlaw. Description: In this week's episode of the Yesner Law podcast, we discuss a potentially scary issue for people filing bankruptcy. What happens when the debtor's house is upside down, behind in payments, and maybe even in foreclosure, and the homeowner wants to use the bankruptcy to surrender the house? Sometimes, the trustees sell the house to an investor, who then rents the house for cash flow until the bank forecloses. While this may seem unfair, it is proper under the Bankruptcy Code and Rules (at least here in Tampa Bay). We discuss when this might happen, and what options the homeowner has to try to avoid this situation. If you have stories where this has happened to someone you know, please share those stories on our social media sites - https://www.facebook.com/yesnerlaw. Or send me an email at Shawn@Yesnerlaw.com. Description: In this episode of the Yesner Law Podcast, we talk about the differences between the Florida Homestead Exemption, and the Homestead Exemption in Florida. What is the difference? One is based on Florida's Constitution and Statutes, while the other is a reduction of the taxable value of the home. The two are related just less so than people think. To find out more, please visit our website. We have many blogs discussing the homestead exemption, including http://www.yesnerlaw.com/blog/2013/05/homestead-asset-protection-strategies.shtml, or you can send me an email at Shawn@Yesnerlaw.com. Description: What happens when a creditor charges off a debt? Does the borrower still owe it? Does it report on credit? Can the creditor sue for it? We answer these questions and more in this episode of the Yesner Law Podcast. Many people get confused on what happens when a debt is "charged off." We hope you enjoy this episode and if you have questions, please email me at Shawn@YesnerLaw.com, or visit the website at www.yesnerlaw.com. Description: In lucky episode 13 of the Yesner Law Podcast (one-quarter of the way through a full year of episodes!) we discuss partition lawsuits. Partition lawsuits are for people who jointly own property and cannot decide what to do with it. Typically, it involves family members who inherit property and one wants to live there and another wants to sell. If you have questions about partition, real estate litigation, or any other areas of law, please let me know at Shawn@YesnerLaw.com, or visit the website at www.YesnerLaw.com. Description: Episode 12 of the Yesner Law Podcast is an interview with Tiffanie Kellog. Tiffanie is dedicated to helping others make more money in less time so they can have more fun. Tiffanie is the #1 trainer in the United States for The Referral Institute, and a trainer for BNI. Tiffanie is also an author and, in this episode, we discuss her new book 4 1/2 Networking Mistakes, which you can order on Amazon. For more information, please visit our website, www.yesnerlaw.com, or email me at Shawn@Yesnerlaw.com. Description: Interpleader is the type of lawsuit that is filed when a real estate transaction is cancelled and the buyer and seller disagree as to who is at fault, and therefore who should get the good faith deposit held by the title company. The problem is that the title company, even if it is an attorney who represents one party, does not have the authority to determine which party is at fault and which party should keep the deposit. Therefore, the title company files an Interpleader Action and deposits the money with the Clerk of Court, to then let the Court decide who is entitled to a return of the good faith deposit. If you have comments on this podcast, or questions, please email me at Shawn@Yesnerlaw.com or visit our website at www.yesnerlaw.com. Description: In this episode of the Yesner Law Podcast, we interview Lee R. Carr, II. Lee practices elder law, estate planning and probate law. Lee helps answer what happens when one spouse dies, leaving the other to help maintain and make payments on the house. Whether the surviving spouse should keep the house, sell the house, modify the loan, etc., are all questions that arise in this unfortunate time, and we can help answer those questions. We welcome suggestions on this episode or future content at Shawn@YesnerLaw.com or www.yesnerlaw.com. Description: In this episode, I talk about a subject that is personal to me because it happened to a friend of mine. What happens when the spouse who signed the loan and mortgage dies, leaving behind a spouse who is not listed as a borrower on the loan? To find out more information about loan modifications, please visit the website at http://www.yesnerlaw.com/Debt-Alternatives/Loan-Modification.shtml, or send me an email at Shawn@YesnerLaw.com. Description: We're happy to have Mr. Jason Avery, owner of Avery Construction back as a guest on the podcast. As a thank you for Mr. Avery being a guest, we've taken the time in this podcast to discuss his newest venture, Constructing Success, which is his newest book and also his newest company. Constructing Success is a consulting firm that supports entrepreneurs through the challenges of growing their small businesses. Jason helps discuss the challenges that clients may have, both in the construction industry and in the legal industry. For more information on Mr. Avery, or any topics covered in the podcast, please contact me at Shawn@YesnerLaw.com, or www.yesnerlaw.com. Description: In this week's episode, I talk about Small Claims Court. When is it appropriate to bring a dispute to Small Claims Court? Why would someone want to file a case in Small Claims Court? Does it make sense to hire an attorney? And other questions. If you want more information, or have questions on this or any other podcast topic, please email me at Shawn@YesnerLaw.com, or visit our website, www.yesnerlaw.com. Description: After a week off for Thanksgiving, we're back with our guest, Jason Avery with Avery Construction. In this episode, we discuss construction, permits and related lien issues. If you have questions about these issues, or want more information, please visit our website, www.yesnerlaw.com, or email me directly at Shawn@YesnerLaw.com. 159. Episode 5 Why Am I an Attorney? Description: Foreclosure Auctions in Florida are "buyer beware." If you're interested in buying at a foreclosure auction, due diligence prior to bidding on the property is very important. Are you buying at the foreclosure auction of the first mortgage, second mortgage, association, or some other judgment creditor, because that distinction could be important. For more information, visit our website- www.yesnerlaw.com, or email me at Shawn@YesnerLaw.com. Description: Our first official guest of the Yesner Law Podcast is Mr. Jason Avery, owner of Avery Construction. Jason and I discuss different issues related to construction law, and how contractors and clients can avoid construction related disputes and avoid attorney involvement. For more information about construction law issues, please visit our website www.yesnerlaw.com.